Enhancer activity (green) and promoter activity (purple) in the same regulatory element. IMAGE: EMBL / Eileen Furlong. EMBL scientists show that some promoters can act as enhancers and vice versa. During gene expression, the information stored in our DNA is transcribed: turned into instructions to produce RNA and proteins that perform specific functions within each cell. DNA regions called promoters are located at the beginning of genes, and determine the starting point where transcription is initiated. Other snippets of DNA called enhancers control when and where specific genes are expressed. Enhancers are often located far away from genes and must relay their regulatory information to a gene’s promoter. Now, Olga Mikhaylichenko and colleagues in Eileen Furlong’s group at EMBL have gained new insights into the role of enhancers and promoters during embryonic development, a life stage where very tight regulation of gene expression is essential. Furlong explains the main findings of the paper, that explores the balance between enhancer and promoter activity within individual regulatory elements in vivo, and that was published in Genes & Development on January 29, 2018. What is the key finding in this paper? “First of all, we were able to show that things are not as black and white as they seemed. Enhancers and promoters are in various states of evolution with some having exclusive promoter function, others having predominantly enhancer function, and yet other elements, distal enhancers, having weak promoter activity. One of the findings that I am most excited about is when we looked at activity in the other direction, asking if gene promoters can act as developmental enhancers. Here, we found that promoters that are bidirectionally transcribed can function as both strong enhancers and promoters, for the same gene. 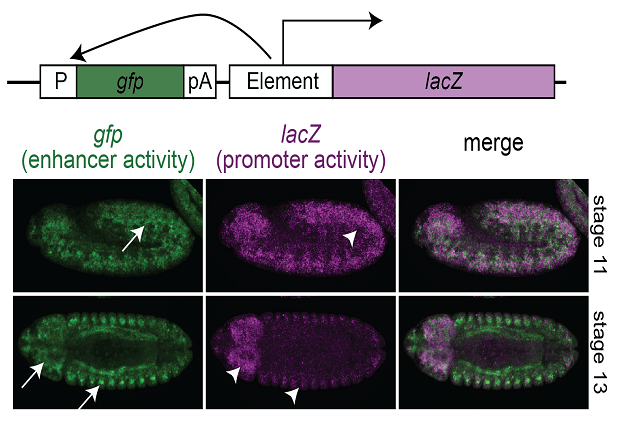 This suggests that they regulate both the levels (promoters) and spatial expression (enhancer) of the gene. Interestingly, promoters that are unidirectionally transcribed cannot perform this function.